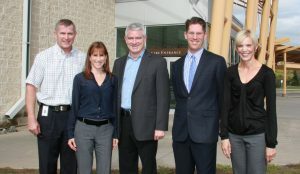 Image above (L-R): Dr. David Puskas – Orthopaedic Surgeon and Medical Director of Musculoskeletal Health at TBRHSC, Caroline Fanti – Program Director, Regional Orthopaedic Program, TBRHSC, Dr. Claude Cullinan – Orthopaedic Surgeon, Program Director for Surgical Foundations – Northern Ontario School of Medicine, Dr. Kurt Droll – Orthopaedic Surgeon and Program Director of Orthopaedic Surgery for the Northern Ontario School of Medicine, Karen Murphy – Advanced Practice Physiotherapist. THUNDER BAY & KINGSTON, February 5, 2018 – Novari Health’s access to care management and central intake technology has been selected and is being implemented as the enabling technology to support Ontario’s Intake & Coordinated Access Model for hip & knee referrals (MSK) in the north west of the province. The Regional Orthopedics Program affiliated with Thunder Bay Regional Health Sciences Centre (TBRHSC), is an Ontario Ministry of Health and Long-Term Care (MOHLTC) Musculoskeletal Centre of Excellence beta site, serving the geographic region of the North West Local Health Integration Network (NWLHIN). The Novari Access to Care platform’s Novari ATC™ module was successfully deployed across the NWLHIN in 2017, as the regional surgical eBooking and wait list management solution. With the selection and current implementation of the Novari eRequest® module, MSK referrals will be processed electronically at the Regional Orthopedics Program’s central intake office in Thunder Bay and then electronically routed, using the Novari platform, to one of four or more MSK assessment centres throughout the region. At the assessment centres, patients will be clinically evaluated by an advanced practice physiotherapist or another skilled practitioner, and if qualified for surgery, will then be forwarded, using Novari technology, to individual orthopedic surgeons for a surgical consult. In the North West LHIN region, patients proceeding to surgery will electronically transition from “Wait 1” (the initial wait time associated with a referral) to “Wait 2” (the wait time associated with the wait for the surgical procedure). This seamless ability to electronically manage both Wait 1 and Wait 2 is unique to Novari Health and provides surgeons, hospitals, and most importantly patients with an integrated end-to-end solution to manage the continuum of care. For security, scalability and ease of implementation, the cloud-based Novari Access to Care software platform is being provided as software as a service, hosted on Microsoft’s Canadian Azure cloud infrastructure. Based in beautiful Kingston Ontario, Novari has offices in Vancouver, Boston and Sydney Australia. Novari focuses exclusively on designing, building and implementing healthcare software solutions that improve access to care for patients and the efficiency of the healthcare system.